Of course I am loving them. 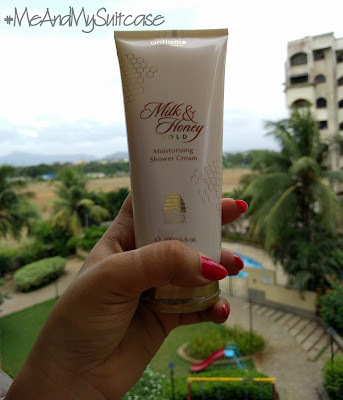 This time I have got this very creamy and soft on body "Moisturizing Shower Cream" - Milk and Honey Gold. Its a luxurious shower cream with moisturizers and organic milk & honey extracts to gently cleanse and leave your skin soft, without feeling dry. In short you will feel splendid. I do. It says cream but is not to be confused with in shower moisturizer, it instead is more like a creamy shower gel (at least for me). As the name goes this one is creamy golden in colour and is very light not only on body but its fragrance too. So people who like strong smell, this one is not for them but still they can give it a try for hydrated and soft skin. Creamy on body, skin feels soft. Value for money (Rs. 499/- for 200 g).